A great window opened up to go an circumnavigate Trial Island came up yesterday, so I set my alarm, got up and headed down to the water. Neap tides and low wind made it pretty much perfect. 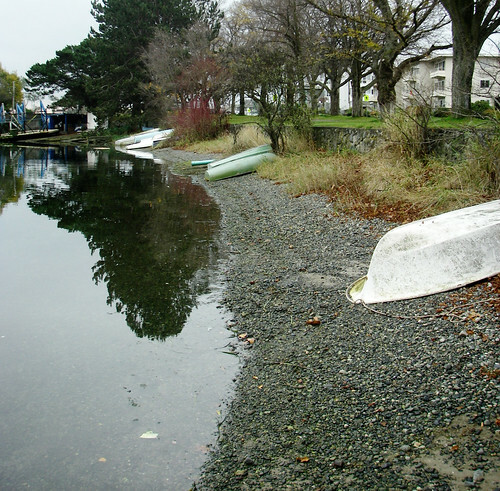 I got to the put in at Oak Bay and put in at scum beach (god it's scummy). 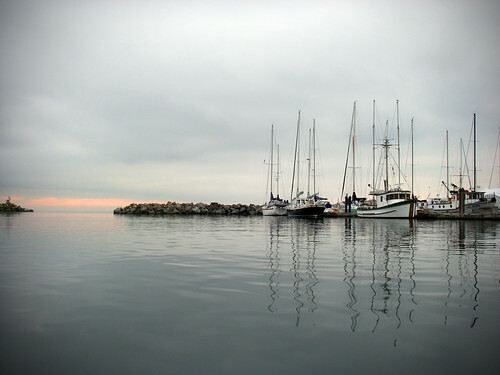 I followed a couple of boats out of the marina and got a nice little push down the coast down to Gonzales Point. The water was beautiful, it was grey out and the clouds were lined with streaks of orange just hanging there above the Olympic range. There were all manner of birds on the water today, most of them hunting out fish and just sleeping in a big huddle. The golf course was just as busy as ever. 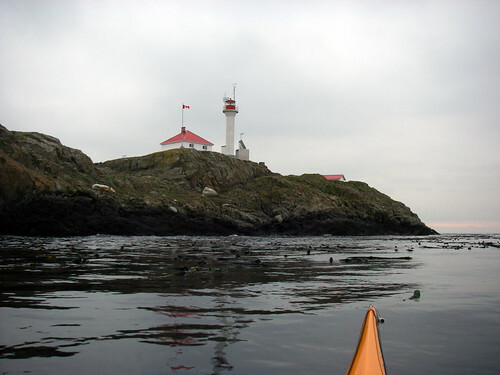 I paddled quietly around Gonzales point and stayed close to shore until I got around to McNeil bay. A number of kayakers had launched from McNeil and were headed out to trial, so I followed them. The water was nice and flat this time round. There was a slight current around the island, but nothing much stopping me from rounding the south tip. I grabbed a discarded coke bottle out of the water and headed into the kelp beds around the south edge. 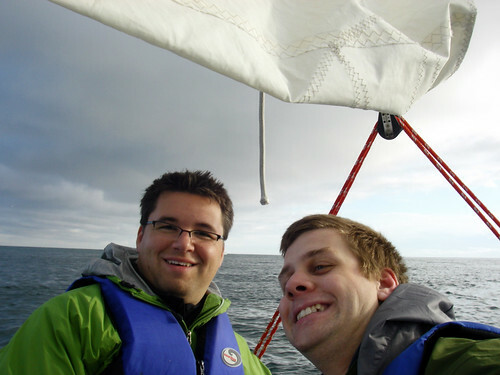 I had to pull up the rudder and just ride over top the thick kelp beds. It was starting to rain a little now, but the water was nice and flat. I pulled up my hood and just put my paddle on my front deck and watched the rain hit the water for a few minutes. So relaxing. 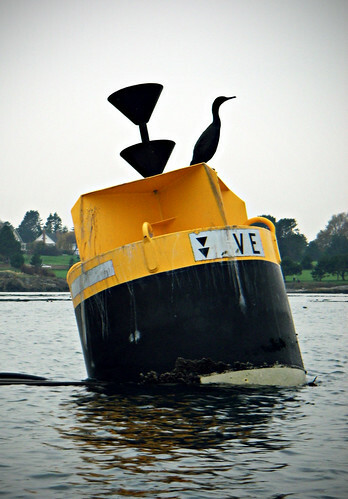 I decided to just head back to oak bay but not before I got a shot of the sideways cardinal buoy in enterprise channel. When I got up near it, a lone cormorant stepped out of the black triangles and hung out front. I was able to get almost a full frame of him and the buoy. 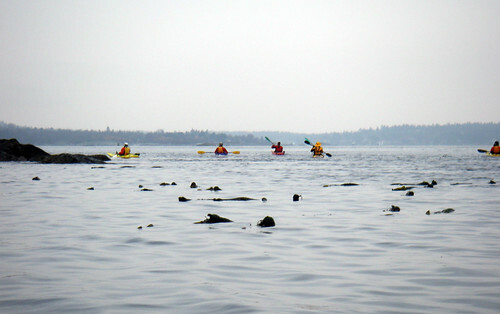 Approaching Gonzales point, I ran into the kayakers again and they were taking a breather at the point. I passed by them and got caught in a fairly fast eddy. I paddled hard to the other side of it and realized the ebb had started. I headed up north to Mary Todd Island. The going was pretty slow in the reefs and the currents were coming from all kinds of directions. I saw a fairly large Bald Eagle eating the last of a fish he'd caught. The rain started coming down pretty hard, so ended the trip. I headed into the marina and got the boat safely back to scum beach. I put the yak on the car and headed into the marina for a much needed coffee. It was colder than I thought. 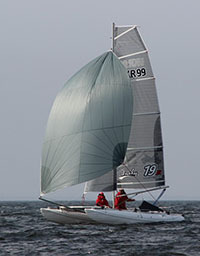 I met up with Aaron again to take out a cal 20 and try and get out sailing. 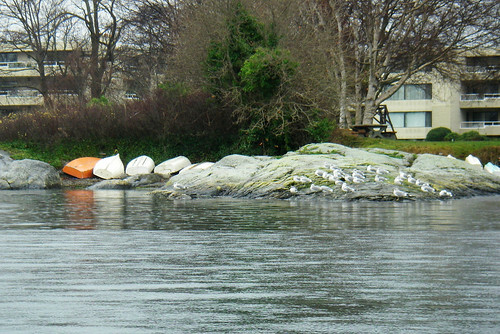 We left oak bay marina to find that we were in a bit of a situation. There were large swells near trial island from the incoming gales and the route through Baynes was directly upwind which would mean a bit of beating in a pretty tight space. We couldn't get the boat to listen to us as we tried to head up wind, then we realized that the current was dragging us south in quick order. We motored back and went for coffee rather than trying to motor out and around ten mile point. A quick day, but always good to figure out the limits of your patience. "In salmons´ land against current"